Preview images, cast list, and spoilers for the Madam Secretary episode "Right of the Boom"
CBS follows up the February 14 episode of Madam Secretary titled “Left Of The Boom” with a continuation called “Right Of The Boom” that airs the next week, on February 21. The two similar titles make us think it’s a two-parter, with the 2/21 installment being Part 2. “Right of the Boom” – Following a shocking event on U.S. soil, Elizabeth rushes to find answers to President Dalton’s many questions about how it was able to occur, on MADAM SECRETARY, Sunday, Feb. 21 (8:00-9:00 PM, ET/PT) on the CBS Television Network. You can find the preview images below. 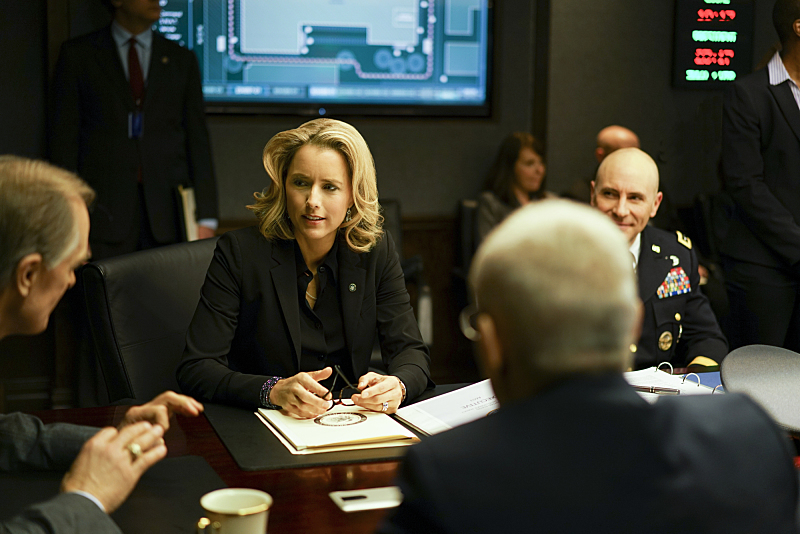 Madam Secretary stars Téa Leoni (Elizabeth McCord), Tim Daly (Henry McCord), Bebe Neuwirth (Nadine Tolliver), Željko Ivanek (Russell Jackson), Patina Miller (Daisy Grant), Erich Bergen (Blake Moran), Geoffrey Arend (Matt Mahoney), Kathrine Herzer (Alison McCord), Evan Roe (Jason McCord), Wallis Currie-Wood (Stephanie “Stevie” McCord), and Keith Carradine (President Conrad Dalton). Recurring guest stars appearing in “Right of The Boom” include Sebastian Arcelus (Jay Whitman), John Doman (Dennis Ellerman), Jordan Lage (General Kohl), Roslyn Ruff (Marguerite Sanchez), Nuah Ozryel (Prince Asim), Tony Plana (Admiral Ed Parker), Jill Hennessy (Jane Fellows), Mandy Gonzales (Lucy), Lindsay Alexander Carter (Linda Peavy), and Clifton Davis (Ephraim Ware). The rest of the guest cast includes Vincenzo Amato (Italian Ambassador Vittorio Civarelli), Juan Carlos Infante (EMT #1), Don Guillory (EMT #2), Desiree Rodriguez (Medical Technician), Adam Donshik (ER Doctor), Cindy Cheung (Dr. Cary), Christopher Gurr (FBI Agent), Adi Hanash (Saudi Official), Baylen Thomas (Swat Team Member), and Catrina Ganey (Nurse).